WHO doesn't love CHOCOLATE?! OR a GIANT CHOCOLATE BAR?!?! 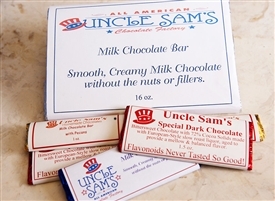 Our rich and creamy chocolate bark in the form of a chocolate BAR! Wrapped in foil and a candy bar wrapper- perfect for topping off a lunch box, making the centerpiece of a gift basket, dropping in your backpack, attaching to a gift, or dropping in the Christmas stocking! Just make sure the stocking is XXL! This is great for when you want a REAL chocolate fix and you need to have it wrapped up! It is the best overall bargain on our website per pound. We make these to order and we can personalize the wrapper as well- please inquire (518)372-2243!